Color: Tarantulas (Theraphosa apophysis) occur in a variety of colors. Many are black or brown in color. Several species also bear distinct stripes along their legs. Size: They are the largest known arachnids. On average, they measure 7 to 10 cm in length. However, they are capable of exceeding 30 cm. 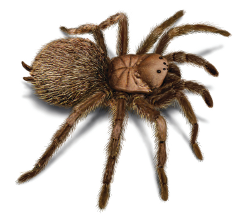 The perceived size of specimens is oftentimes exaggerated, due to the tarantula’s abundant hair. Hair: They are distinguishable from other spiders by the dense body hair. This hair, which covers the entire body of the tarantula, serves as a defense mechanism against predators. Exoskeleton: They have strong exteriors known as exoskeletons. The tarantula's body is comprised of two major parts: the prosoma, also known as the cephalothorax, and the abdomen, or opisthosoma. These two parts are joined by a pedicle, or pregenital somite, which is perceived to be the waist of the tarantula's body. This pedicle is crucial to the mobility and agility of these spiders, as it allows the opisthosoma a larger range of movement. Legs & Fangs: The eight legs, pedipalps and fangs of the tarantula are also connected to the body at the prosoma. The chelicerae, or fangs, which release venom, are located below the eyes. The legs are seven-segmented and feature retractable claws, which are used for climbing. Hairs present on the legs are also useful in climbing upright or slippery surfaces. How Did I Get Tarantulas? During summer and fall, tarantulas may wander into homes by slipping through open doors or torn window and door screens. They can also find their way into window wells or gutters. From here, the pests move into houses through cracks in home siding or spaces under the home’s crawl space. They also dig burrows in soil near homes. The pests can slip through foundation cracks to enter basements or crawl spaces. Homeowners with ant or beetle problems are most likely to have tarantulas near the home, as these are convenient food sources for the spiders. Although frightening in appearance, tarantulas are only aggressive when provoked. They move quickly for short bursts and inject their prey with venom in order to paralyze it. This venom is toxic to small animals but is not known to be life-threatening for the average human adult. Tarantulas have long, needle-like fangs. They rarely bite humans, but can if they are provoked or unable to defend themselves by escaping. U.S. tarantula bites are not normally serious, and the bite produces pain comparable to a honey bee sting. However, if a tarantula bites a person who is highly allergic to the venom, typical reactions to the bite may include pain, breathing difficulty, itchiness, rapid heart rate, and swelling at the site where the bite occurred. In addition, tarantulas have spiky hairs on their bodies. When handled, they can release these urticating hairs that cause itchiness and discomfort. Some species are capable of launching them at predators with their back legs. If the spider's body hairs contact the eyes, a person may experience swelling and redness of the eyes and nasal passages. How Do I Get Rid of Tarantulas? Your local Orkin technician is trained to help manage tarantulas and similar pests. Since every building or home is different, your Orkin technician will design a unique program for your situation. Orkin can provide the right solution to keep tarantulas in their place...out of your home, or business. Five genera and 30 species of tarantulas have been documented in the United States, each with its own scientific name. There are over 800 documented species in the world. Eurypelma californicum - This species is the most common tarantula in the U.S. and can be found in the desert areas of California, Texas, and Arizona. Aphonopelma chalcodes - Also known as the desert tarantula, this species is primarily found in Arizona and other arid locations. Desert blond tarantulas can grow up to 7.5 cm in length and range in color from gray to dark brown. Aphonopelma hentzi - Otherwise known as Texas brown tarantulas, this species can be found in Kansas found around rocky habitats or hillsides. Brachypelma vagans - Although tarantulas are not native to Florida, several species have been introduced due to pet trade and importation. The most recognized species in Florida is the Brachypelma vagans. Originally of Mexican origin, these spiders are believed to have entered Florida in the 1980s, although official identification did not occur until 1998. Also commonly known as Mexican red rumps, these arachnids are black with red abdomens. While painful, their bites are not fatal to humans. Tarantulas typically live in arid, semidesert regions and in tropical rainforests. Some are arboreal and spin silken retreats in tree holes, while others are terrestrial and dwell in burrows. Tarantulas are capable of producing silk and can use it for similar purposes, depending on species. Even the burrowing terrestrial species use silk to line their burrows, and some use silk to create door-like entrances to their burrows. The tarantula’s silk acts as an alarm system, alerting the arachnid to potential threats or prey outside its home. Life cycles vary from species to species. The life cycle begins with the mating process, during which males leave their territories in search of mates. Male tarantulas can travel great distances in order to locate females (which leads people to think they are migrating). Unfortunately, their wanderings may lead them into contact with people, such as on roadways or in people’s homes. Males usually spin a web onto which they deposit sperm, and then draw the sperm web into their pedipalps. Once they locate a female, they test her receptiveness by tapping near her burrow or web. After performing a specialized courting ritual, males fertilize females and then move on quickly, as females are sometimes known to devour their mates following sexual contact. However, males that resist consumption rarely survive more than a few months following copulation, while females can live up to 35 years. Females deposit their eggs into cocoon-like structures known as eggs sacs. These eggs incubate for a period of time and hatch into young tarantulas, which molt several times as they grow. All tarantulas undergo molting, during which they shed their exoskeletons in order to grow. Molting continues throughout the life of the female, while males usually cannot successfully molt after they become mature. The natural enemies of tarantulas are varied and include other arachnids, such as scorpions. Because both arachnids reside in desert habitats, they may come into contact with one another. While both are equipped with specialized defense mechanisms, scorpions might overcome tarantulas with their more powerful venom and claws. The tarantula hawk, a large wasp, is one of the tarantula’s deadliest enemies. Some are metallic blue to green with reddish orange wings. The tarantula hawk uses its venom to paralyze the tarantula. The wasp then drags the prey back to its lair, where its immobilized body is used as an incubation site for their eggs. When the eggs hatch, they consume the tarantula’s still living body.